The Sterilization Exposure Cycles test exposes samples to the given sterilization cycle to assess feasibility and functionality following the sterilization process. Various standards require the form, fit, and function of a medical device or product to be assessed following all of the manufacturing processes up to and including sterilization. ISO 11135-1:2007 recommends that the product and packaging meet safety, quality, and performance at the “most challenging process parameters for the product/package.” New products, modifications to current products, packaging assessments, and even raw materials and components that are exposed to the given sterilization process should be tested to determine if any adverse effects are observed. Nelson Labs has fully programmable ethylene oxide, steam, vaporized hydrogen peroxide, and dry heat sterilizers that mimic customers’ sterilization processes. 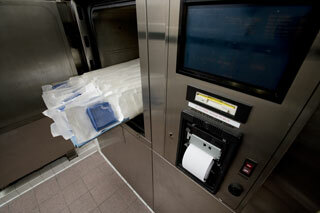 Samples tested can be exposed faster and less expensively than with the corresponding contract sterilization cycles. The Sterilization Exposure Cycles test ensures feasibility and functionality following a product’s exposure to the worst-case sterilization cycle. This is essential, since sterilization processes can be damaging to the finished product and packaging due to exposure to high temperatures, pressure and vacuum changes, humidity, and the sterilant. Important note: There is an inherent risk of product damage during sterilization due to excess moisture and/or possible temperature spikes during steam addition. It is the responsibility of the sponsor to assess this risk and determine the suitability of their product. Nelson Labs does not assume responsibility for this risk. Sample size required: The biggest EO chamber internal dimensions are 18 x 18 x 36 inches. If samples do not fit into sterilizers in a single load, they may be divided into different loads to accommodate the samples. It is the responsibility of the sponsor to verify sample dimensions in order to prevent any delays with their exposure. If you have additional questions about Sterilization Exposure Cycles test services, or would like to consult with the experts at Nelson Labs, just send us a request or call us at (801) 290-7500.